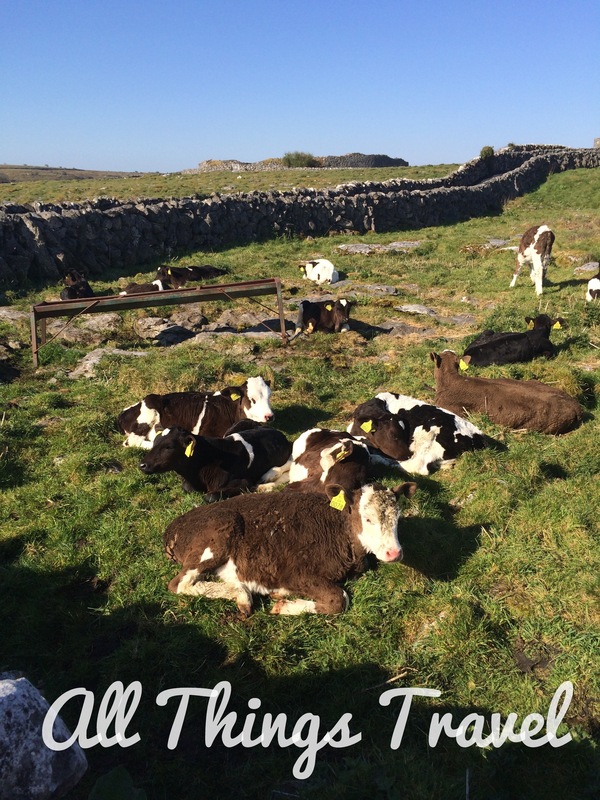 “It is a country where there is not water enough to drown a man, wood enough to hang one, nor earth enough to bury him.” So said Englishman Edmund Ludlow in 1651 while in the Burren on a campaign to subdue the rebellious Irish. 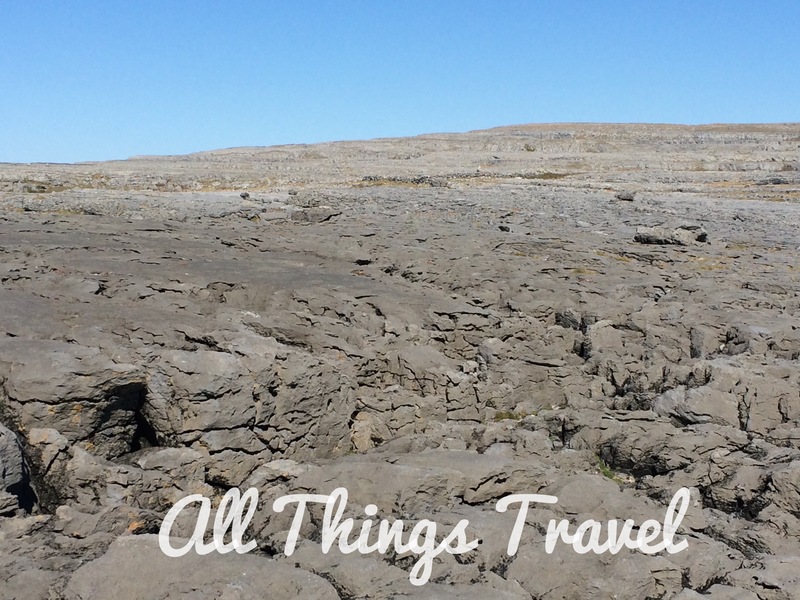 Covering an area of nearly a hundred square miles in County Clare on the west coast of Ireland, the limestone rock that comprises the Burren was formed over 350 million years ago, then polished by glaciers in the last Ice Age. The result is a stark, desolate landscape that looks almost lunar. It’s a karst landscape which is limestone terrain characterized by fissures, caves, and sinkholes caused by water eroding the soft rock. 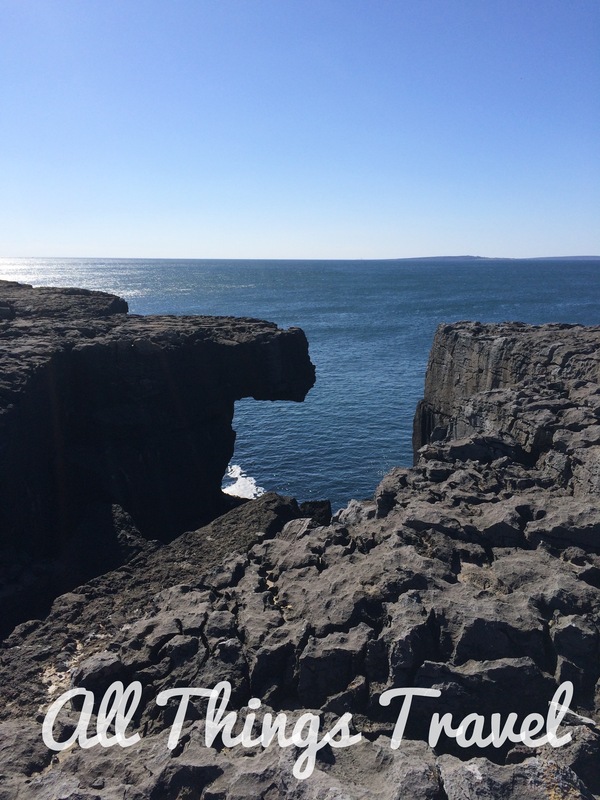 So, while the land appears arid and parched without surface lakes or rivers, rain and underground water actually carved the Burren. The map below on the left shows our tour route of the Burren (enlarged) and the one on the right shows all of Ireland with the Burren marked in pink on the west coast. Our first stop was the Burren Smokehouse at Lisdoonvarna (A on the map above), where we saw a video that explained the difference between hot smoked and cold smoked salmon. 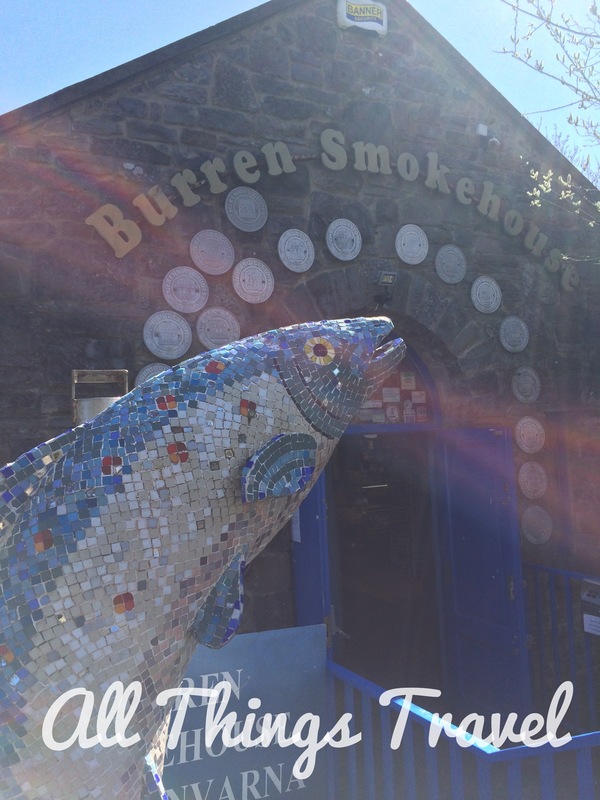 Traditional Irish smoked salmon is cold smoked (35 degrees centigrade or 95 degrees fahrenheit) but they offer both products at the Burren Smokehouse. After sampling the two, my favorite was the hot smoked. We decided to buy the sampler package that contained smoked mackerel and trout in addition to both hot and cold smoked salmon. You can find this product and others on their website here. 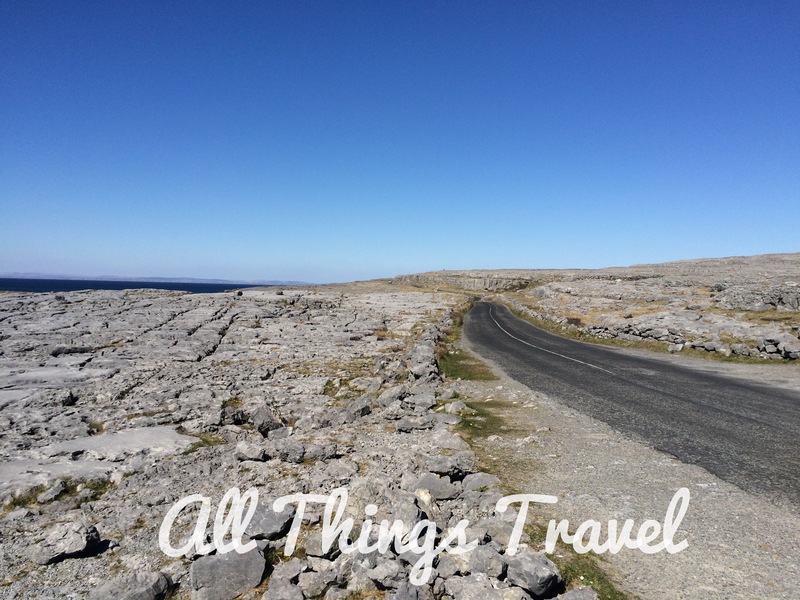 The sales staff in the shop recommended we first explore the coast drive along the Atlantic in the Burren so off we went in search of R477 (up to point B). 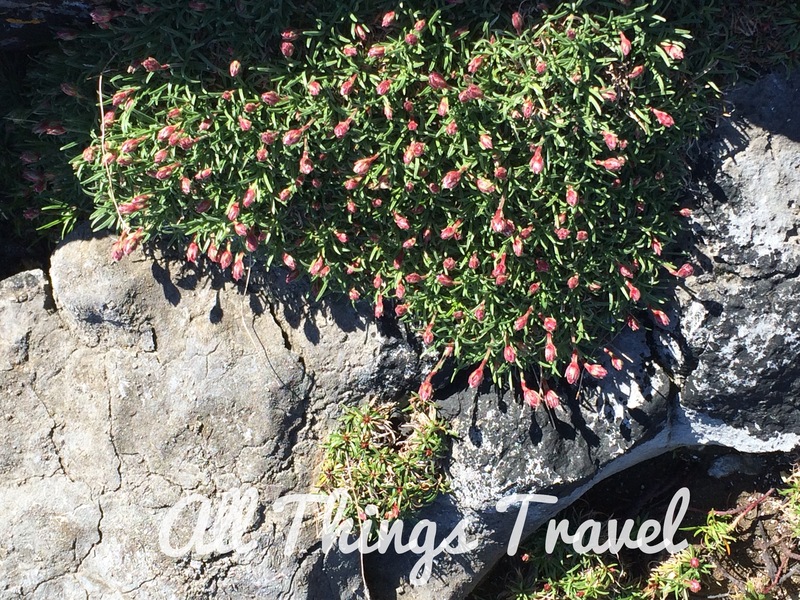 In spite of the rocky bareness, we were delighted to discover flora that maintained a tenuous hold providing an added element of beauty to the landscape. 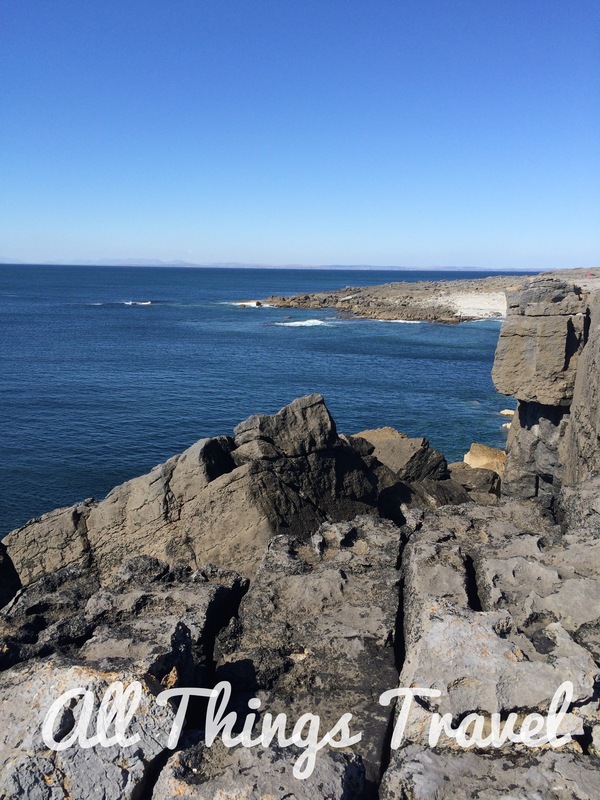 When we reached the coast and saw the Burren with the backdrop of the Atlantic, it was positively breathtaking. 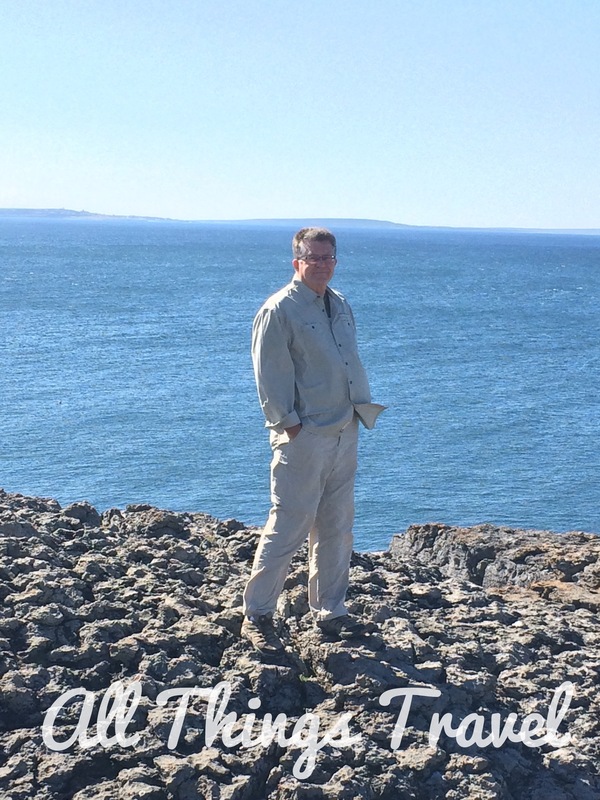 We stopped at every opportunity to enjoy one captivating view after another. 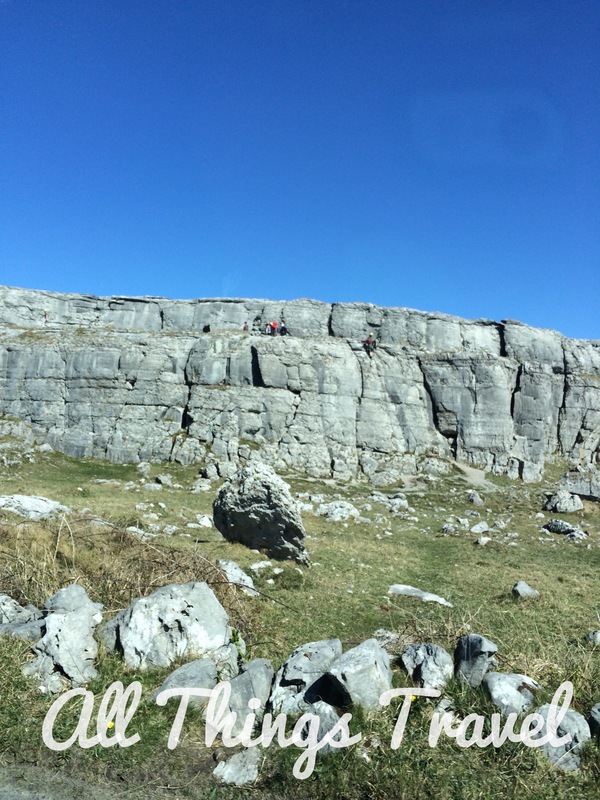 We even spotted rock climbers scaling the walls of the Burren, although we didn’t see any of the wild mountain goats that also inhabit the area. 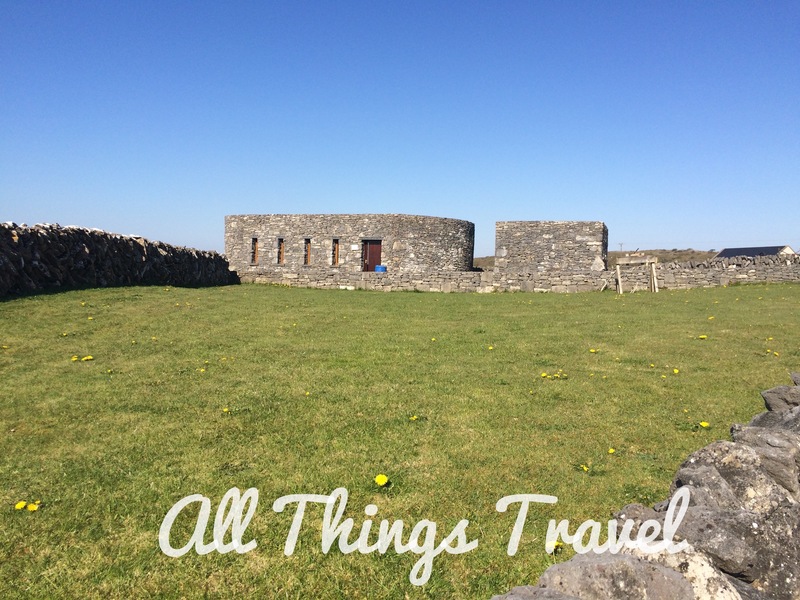 At the ring fort at Caherconnell (point D), we spotted a number of rats scurrying about the fields among the cattle (which frankly, kind of freaked me out. ) They also advertise sheepdog demonstrations onsite but we passed on that. 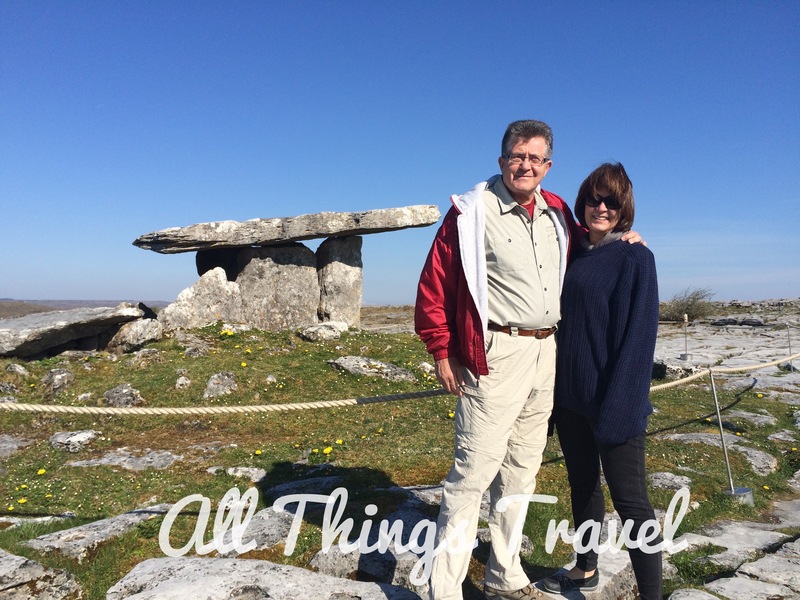 Our final stop in the Burren was at Poulnabrone Dolmen (point E), a portal tomb over 5000 years old that contained the remains of over 30 people when excavation began in 1986. 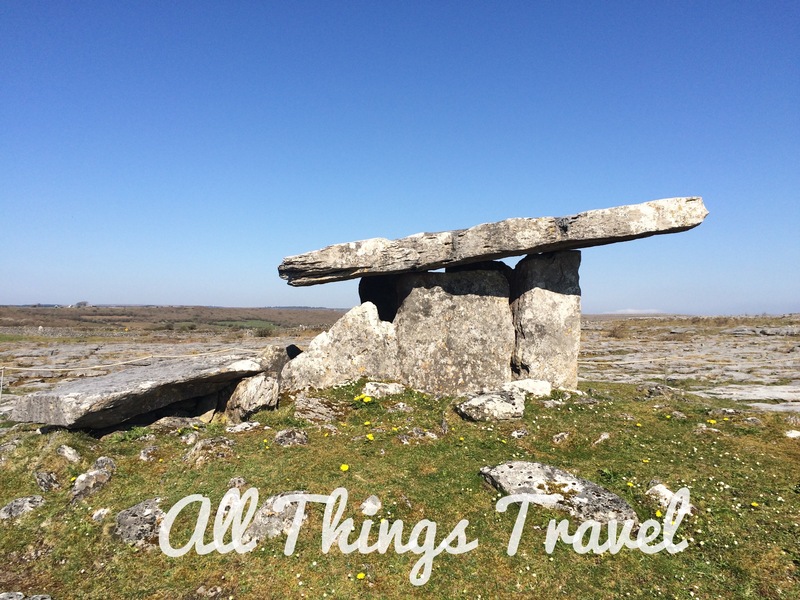 A dolmen, or portal tomb, is a burial site marked by a capstone supported by surrounding stone columns. There are over 100 such burial chambers mostly in the northern part of Ireland but this, I believe, is the best known and most thoroughly excavated. 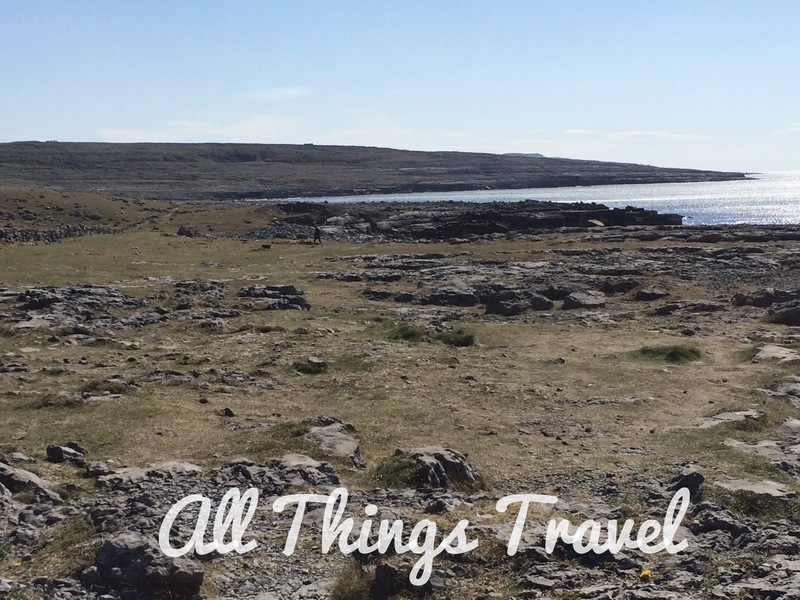 If you visit the western coast of Ireland, check out the Burren. 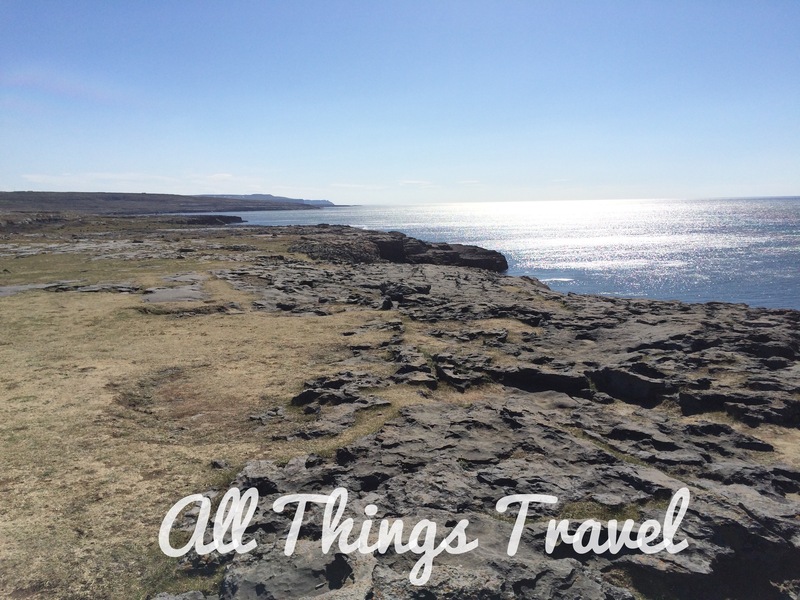 It’s less than a half hour drive from the Cliffs of Moher and less than an hour from Galway. We found it was a memorable experience. Based on events from April, 2015. It does look like a memorable day! Other than the rats scurrying around it looked like an amazing experience. I would have been a bit freaked out by those as well. Yeah, but it was kind of interesting, too, to see them out in the field. 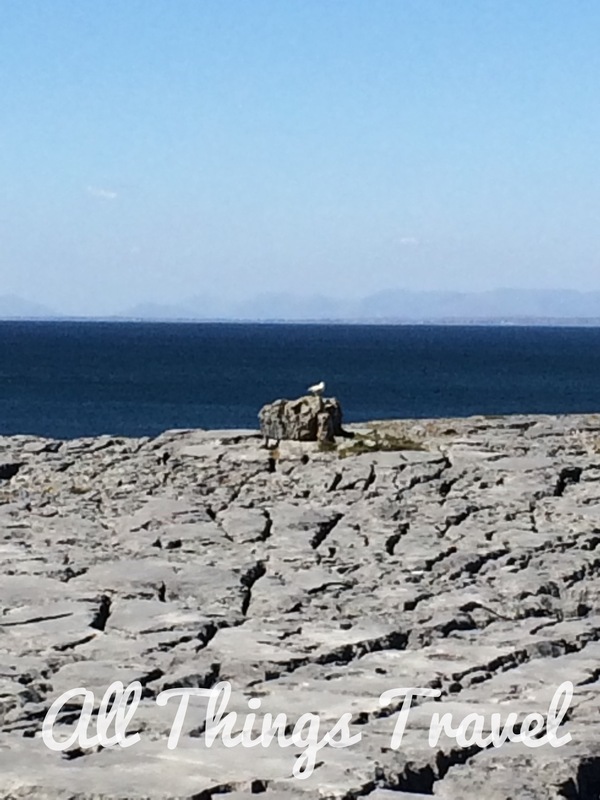 The Burren in Ireland was like seeing the Badlands in the US. Such a different landscape than the usual that it really stands out.